Dig a hole, slow the days? Your question inspired my assistant Una to new heights of invention, Mark. She announced you’d given her an idea for an advanced recreational concept that would improve your life and the sucky economy, too. First, she declared, let’s acknowledge basic principles. It’s true a hollow Earth would spin slower than the current solid version, due to conservation of angular momentum. The standard example of this is a spinning figure skater. To start her spin, a skater initially flings her arms wide. Then, once spinning, she pulls them close, causing her speed of rotation to dramatically increase. The crowd having been suitably impressed, she spreads her arms wide again to slow down. Planets work the same way, Una went on. The more of a planet’s mass you can concentrate at its axis of rotation, the faster the spin and the shorter the day. Conversely, if you shift mass from the core to the equator—in effect, hollowing out the planet—it’ll slow down. That’s the basis of my scheme, she declared. Think how often you’ve been awakened from a sound sleep by the alarm and punched the snooze button for a few more Zs. That doesn’t solve your problems, it merely postpones them. With less time to get ready, you arrive at work in a groggy and unproductive state. How much better if, instead of the snooze button, you flip on some turbines and cause magma to be pumped from the center of the earth to the surface, thereby slowing the planet’s rotation. No short-term fix here—the day would actually become longer. Everyone would get more sleep and show up for work full of vigor, significantly increasing the nation’s GNP. A useful byproduct of this concept is that the Earth would now be hollow, and anything inside it would be completely weightless. This woke up Little Ed, my other assistant. You mean in the exact center, he asked, because there’s equal mass on all sides? Spoken by somebody who obviously didn’t get a 5 on the AP calc test, Una said. Think of it this way: Suppose we place you at a random spot inside hollow Earth that isn’t the center. The part of the Earth’s mass nearest to you—call it mass A—pulls you toward itself, but there’s a larger mass, B, on the opposite side of the planet, pulling you in the other direction. Yes, B is farther away, which lessens its gravitational attraction compared to A’s, but its greater size compensates for that. 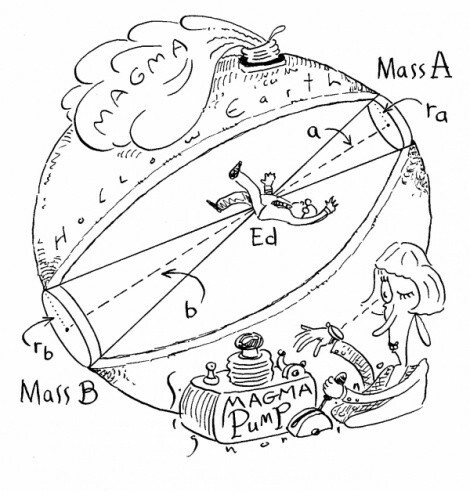 In fact, if we examine the illustration that the gifted Slug Signorino has been kind enough to provide, and assume hollow Earth is a spherical shell of uniform thickness and density, we see (via equations suppressed here but viewable by the curious at the Straight Dope Website) that for any two masses on opposite sides of you, the smaller but closer mass A and the larger but more distant mass B pull on you with precisely equal force. Ergo, all such forces cancel out, and you’re weightless anywhere inside hollow Earth. This brings us to the advanced recreational concept of which I spoke, Una continued. Why kill yourself working out after a hard day at the office, when it would be so much more aerobic to carom weightlessly around inside hollow Earth like a human jai alai ball? In no time, we’d be as fit as gods. True, the interior surface of hollow Earth, assuming a way could be found to prevent the whole thing from caving in, would consist of molten iron at a temperature of close to 10,000 degrees Fahrenheit. However, Ed, you live in Chicago. In winter, that won’t sound half bad. Huh, said Ed. But here’s a practical question. How much of the Earth’s core would you have to pump out? Well, said Una, suppose we want to slow the earth’s rotation by 15 minutes per day. The amount of magma we’d have to pump from the core to the surface would be 59 million trillion tons, a little less than 1 percent of the planet’s total mass. If we spread it out evenly, this would give us a layer of iron covering the Earth’s entire surface eight miles thick. No doubt environmentalists will squawk about the deleterious impact on the quality of life. However, the problems aren’t insurmountable. If we pump the magma back down in the afternoon, things will be just as good as new, plus quitting time will arrive 15 minutes sooner. To assuage the persnickety, we can keep the Statue of Liberty and the Wisconsin Dells permanently pristine. Meanwhile, come on. You think Ecuador is really going to be missed?